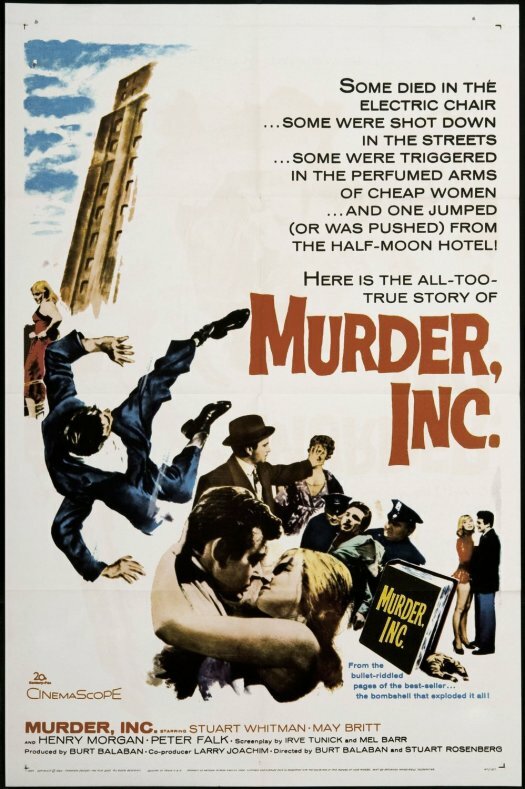 American filmgoers have had a long love affair with the gangster movie. The Pre-Code era was riddled with rat-a-tat-tat tommy gun action from Warner Brothers, MGM, and the other studios, helping to make stars out of Edward G. Robinson , James Cagney , Clark Gable , and a host of movie tough guys. Things quieted down once the Code was strictly enforced, but the gangster was still around, sometimes in comedy masks as likeable lugs, deneutered yet always lurking on-screen in some capacity. This entry was posted in Film, Film Review and tagged 20th Century Fox, Cracked Rear Viewer, David J. Stewart, gangster movies, Gary Loggins, Joseph Bernard, May Britt, Murder Inc., Peter Falk, Stuart Whitman, Through the Shattered Lens. Bookmark the permalink.